Aside from floors and walls, lighting matters! We've discussed in past posts about the importance of layering lighting but in places like the bathroom or the kitchen it's even more important. There's a level of mood lighting that needs to be achieved in these spaces but there's also task lighting that's important as well. So today we're going to break down for you all of the different types of kitchen lighting and how to select the best combination! For starters, let's talk about all of the different types of kitchen lighting. Most kitchens have can lighting which is just recessed into the ceiling. It's for overall view and less about highlighting portions of the kitchen or being helpful for task lighting. Next, there are pendants. Pendants typically go over a bar. They are more directional and are used to highlighting food when people sit at the bar to eat. They can add to the ambiance but are more of a task light. Next, there's island lighting. Island lights are often decorative and while they highlight the island, they are larger so they work to light up the kitchen as a whole as well. There's also track lighting which, in our opinion, is terrible for the kitchen because it collects dust, but it's a directional/task lighting option as well. Most kitchens will usually have at least 2 different types of lighting--some sort of overhead general lighting (like cans) and then usually some sort of decorative lighting like a pendant. If you're kitchen nook is close to your kitchen, the nook lighting which is usually a hanging pendant style will be in the same view as well. There's also under cabinet lighting which adds a really nice mood to the kitchen but is less for task purposes and more for ambiance. Cans are important because they are the main light source. Can lighting is laid out over the cabinet/countertop space in the working/task portion of the kitchen (along the walls). It's meant to be available for food prep. A good island light is the appropriate size and scale for the kitchen (it brightens it up but also gives off a softer light than the cans so it adds to the layering. It's directional in that it highlights the island and also works to ground/center the island in the kitchen. That's one of the things we love most about lighting--it defines the work spaces. Pendants are often decorative too and add a softer element. They warm up a space by adding more texture to the kitchen. Since most kitchens are countertops, cabinets, and stone, a shaded light that gives off a soft glow or even a little bit of texture can really add to the space. Our recommendation is to put any sort of hanging fixture--i.e. pendants, nook chandeliers, and island lights on dimmers. This gives you more control of the light in the space which helps you control the mood. If the cans can be on dimmers too, even better! Sometimes you need a lot of overhead light and sometimes you don't. Dimmers help you control the amount of light output you have which is always a good thing. Finally, don't be afraid to go a little funky on your kitchen lighting. Lighting is art, especially in a kitchen where's there might not be a lot of wall space to hanging sometimes decorative. 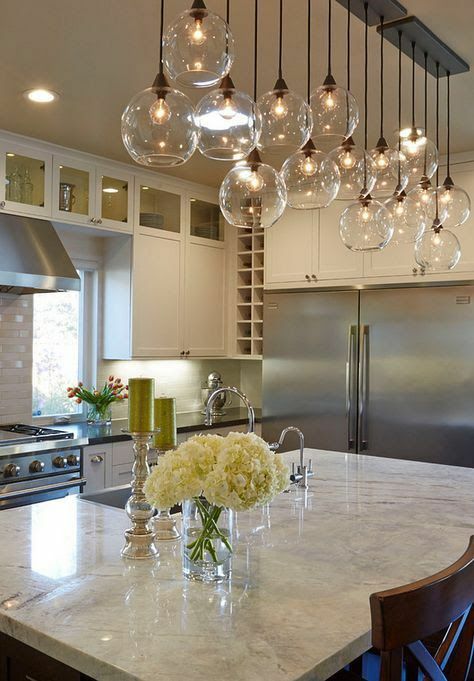 Fun pendants or a cool island light can really make or break the kitchen so don't be too shy!